An apple a day keeps the doctor away is a saying we have heard most of our lives. But John Chapman, better known as Johnny Appleseed, has a slightly different version: Eat an apple before you go to bed, and make the doctor beg his bread. 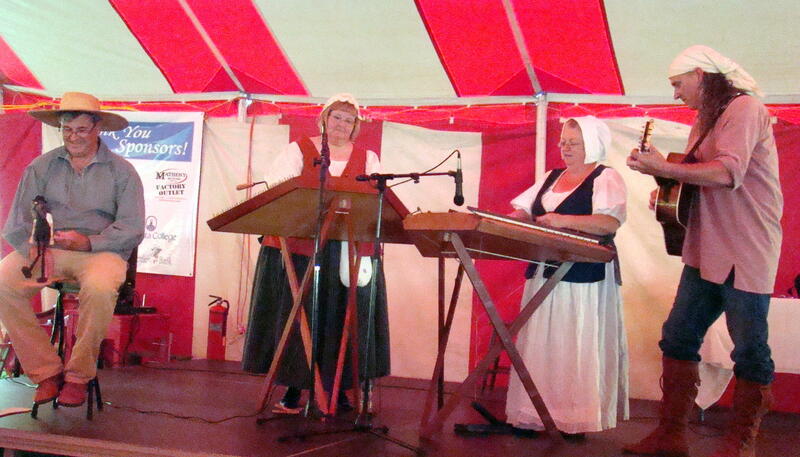 Each evening before the appearance of historical scholars, local musical groups entertained with songs from frontier times. This particular evening a group called Unwound presented lively music on two hammer dulcimers accompanied by guitar and tapping Limberjacks. They got the crowd in the Chautauqua tent at Marietta Ohio ready for the appearance of Johnny Appleseed, an excellent yarn spinner. John Chapman wanted to do something useful with his life that would also support his ministry. Apples seemed to be the perfect tool as they were the only fruit that could stay fresh for an extended time. There was a litany of uses given by John regarding his favorite fruit: apple chips, apple butter, apple brandy, and even payment for taxes…to name a few. Would you believe his favorite color is apple red? Starting a nursery for Johnny was a simple affair: poke a hole, plant a seed, cover it up. He tried to anticipate where people would be settling in two or three years and would start a nursery in that vicinity. Johnny said that in order to claim the land, the homestead law required settlers to plant fifty apple trees during the first year. Sometimes you might see him going down the Ohio River with two canoes: Johnny in the first one, 50 apple seedlings or apple seeds in the second. In 1812 when troubles in America erupted with the British and the Indians, Johnny said the fear grew deeper than the snow. These war years were painful for Johnny, as he had always been friends with both Indians and whites. Trying to make peace was like trying to put out a fire – while you were stomping on one, you were fanning the rest. At this time, he felt the Indians were like a tornado – you never knew where they were going to strike. But you couldn’t always trust the British either as they burned whole villages – another white man’s promise up in smoke! With his constant good humor, he admonished listeners not to believe everything they heard about him, “Gossip is like the measles, sooner or later it will turn your face red.” For example, barefoot Johnny Appleseed did not walk over the entire country. His travels and consequent apple tree plantings only occurred in New York, Pennsylvania, Virginia, Ohio, Michigan, Indiana, Illinois and often in a State of Confusion. Johnny was deeply religious and felt his religion gave him a peaceful path to tread. His was the perfect life in his eyes because sometimes he was with people… but sometimes by himself. He often enjoyed being alone and said he was not “the marrying kind”. He spent his life doing good deeds for others and planted more than just apple trees. He also planted spiritual seeds that nourished the soul. 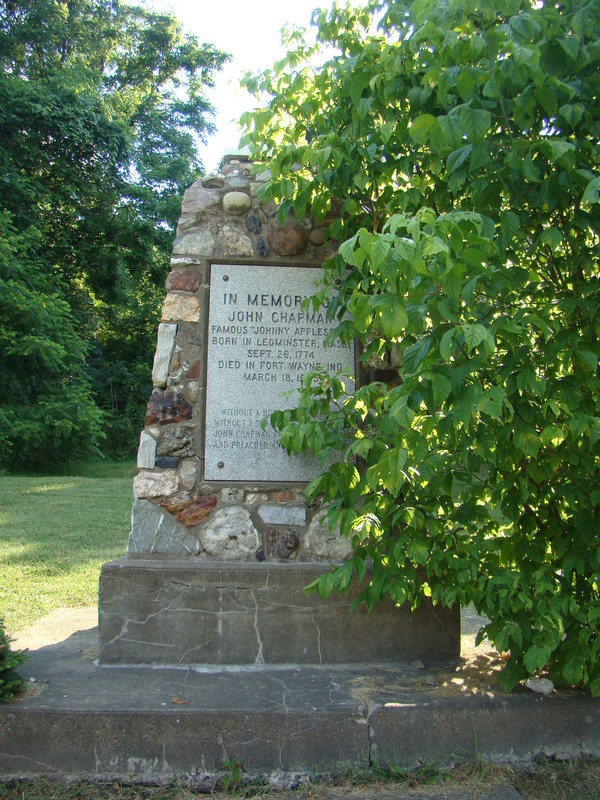 Along the way to Marietta, stopped just south of Dexter City on SR 821 to see a monument dedicated to Johnny Appleseed. It is made of small rocks contributed by people in areas where Johnny planted apple tree. The grave sites of his family are located nearby. The tree to the right behind it is, of course, an apple tree. 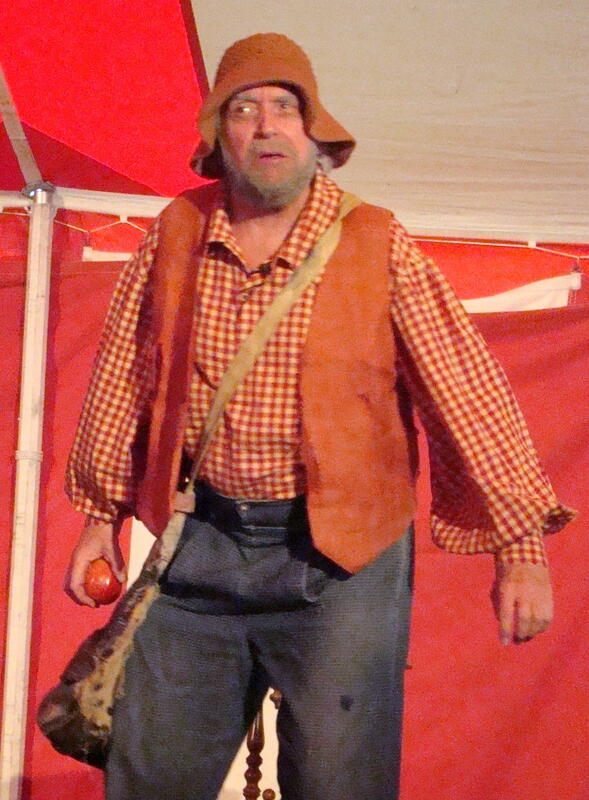 Hank Fincken displayed a great sense of humor in his portrayal of Johnny Appleseed /John Chapman. Johnny was the first historic figure that Hank ever developed. He feels it opened doors for him much the way Johnny’s seedlings opened doors for early settlers.